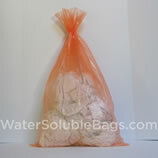 Extra Packaging is an experienced supplier of water soluble bags (aka dissolvable bags) in sizes ranging from 3" x 3" to 60" x 60". 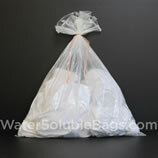 We also carry new sling bags for mops (janitorial mop heads) with bottoms that are double reinforced. 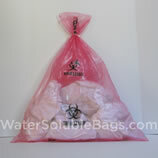 Our water soluble bags are ideal for laundry applications in healthcare facilities, hazardous waste facilities, extermination/bedbug elimination, and more. Utilize our bags to avoid contamination and prevent infections with our eco-friendly and hygienic solutions which minimize contact between staff and laundry and minimize risk of contact with airborne bacteria, infectious body fluids, bloodborne pathogens, bedbugs and other contaminates. 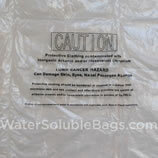 Special bags for dry welding garments that comply with OSHA's regulations for hexavalent chromium handling. 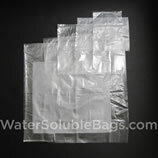 These bags are puncture resistant and allow for multiple days of dry or wet storage. 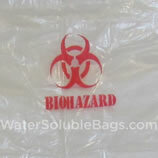 All of our bags are latex free and will not harm linens, laundry machines or waste water treatment systems. 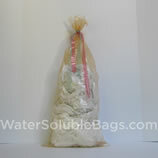 Our bags dissolve completely and are highly resistant to most organic solvents, greases, fats and oils. They are impermeable to most gases and will not generate a static charge. Most of our bags close with a tie-tape that comes attached to the bag. NATIONAL FIRE PROTECTION ASSOCIATION 56A "STANDARD FOR THE USE OF INHALATION ANESTHETICS."